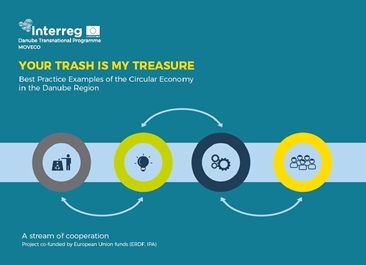 The MOVECO Brochure » Your trash is my treasure « displays best practice solutions for Circular Economy in the Danube region. Each country of the MOVECO partnership has chosen one inspiring circular product or business model that could set an example for others. Thus, we show examples from Germany, Austria, Slovenia, Hungary, Slovakia, Croatia, Serbia, Romania and Bulgaria.